Thanks to mobile, consumers expect brands to be there anytime, anywhere with helpful information. 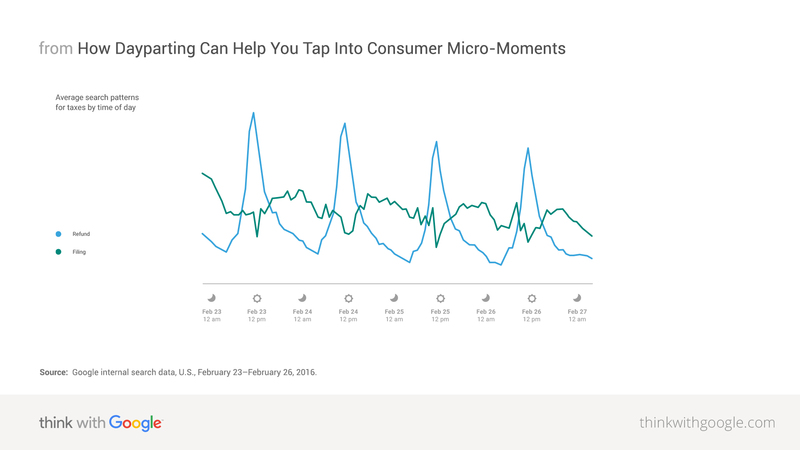 Lisa Gevelber, Google's VP of marketing, shares how to be more relevant by factoring in the time of day that someone is searching. Whether it's the weekend or an entire year, time can sometimes feel like one big blur. It's certainly turning out to be true in my family. We've gone from picture books to how-to-parent-teenagers books seemingly overnight. Which is why one of my favorite parenting quotes is "The days are long, but the years are short." This is especially true if we're not deliberate about taking steps to really be present in each moment along the way. The same often applies to marketing. Many of us are trained to be sensitive to the seasons of the year and how demand changes accordingly. But when analyzed on a daily basis, time offers incredible contextual signals across an array of individual (and brief) consumer moments. Add what we know about a consumer's intent, and we can uncover powerful insights that help us be both present and relevant in those important moments. The timing of searches during the day can be just as important to your sales and customer relationships as the seasons of the calendar year. So the new question is: Are you paying attention to the seasons of the day? The timing of searches during the day can be just as important to your sales and customer relationships as the seasons of the calendar year. By dividing the day up into parts—in other words, dayparting—we can pay closer attention and be extra-relevant to people in their micro-moments. Let's start by thinking about time of day from a device perspective. Consider a typical day and how your behavior changes across screens as you move from morning to night. More searches happen on mobile than on computers and tablets for 15 of the 24 hours during a typical weekday.1 The chart below illustrates the pattern: Mobile leads in the morning, but computers and tablets become dominant when people get to work around 8 a.m. Then mobile takes the lead again for the afternoon commuting hours and all night. Of course, mobile search surpasses computer/tablet searching during the weekend. These examples represent aggregate device patterns across all searches. But not every product or service category follows these device patterns exactly. Consider baby products. 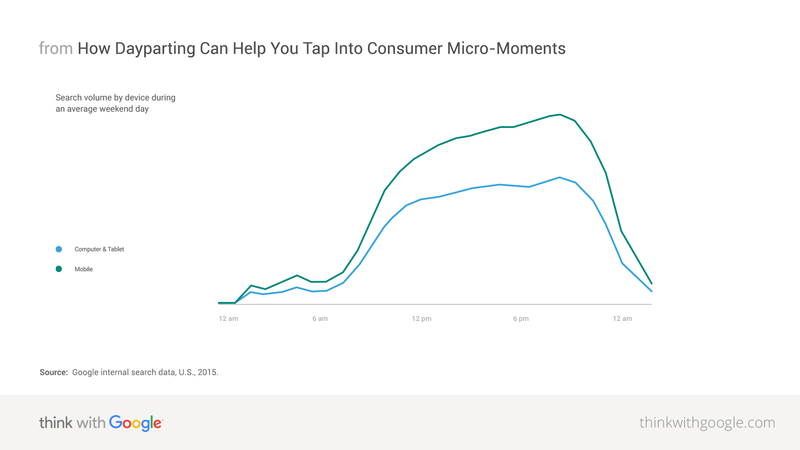 In that category, mobile searches reign supreme throughout the day, but show a pronounced peak around 9 p.m. This behavior reflects the broader context and mindset of the people behind those queries. After the baby is asleep and parents have some time for themselves, it's a more fitting time to do some (mobile) research on infant swings and cribs. To understand how to better engage your target audience, find out the daily device patterns for your brand or category. Ensure your brand is ready to respond to intent that arises at all times, across all devices—and that your budgeting, bidding, and messaging strategy are aligned. Different queries or subtopics might peak at different times. By digging deeper into various types of intent within your category, you can see interesting patterns during a typical day. Let's talk taxes. This chart shows how refund-related searches peak in the morning, while searches about filing your taxes happen mostly in the afternoon and evening. In this age of electronic filing, the first thought on a lot of people's minds in the morning is "Where's my refund?" But for people who have yet to submit their taxes, things are a bit less urgent (and less fun). They put their searches off until later in the day. Interesting patterns, but why would it matter to marketers? Whether you're an international tax preparation service or a local accounting firm, it's likely that these different consumer needs correlate to different customer values for your business. Those searching for tax filing are likely more valuable prospects than those searching for tax refunds. By having deeper insight into why those different needs are expressed at different times, you can optimize your bidding to win the consumer moments you care most about. You may not be in the tax business, but your industry may have these same kinds of hidden patterns—and acting on them can drive real impact. For example, Electricity Wizard, a leading energy broker in Australia, tapped into data from the Google forwarding numbers the broker had implemented in its search campaigns. Using those insights, Electricity Wizard learned that between noon and 2 p.m. each weekday was when it was losing or missing the majority of its I-wanna-talk-to-a-human moments. So it restructured the lunch breaks of its call centers, lowering its abandonment rate by 85%. There was once a time when we all could relate to the idea of "going online." There were hours of the day when we weren't online, and other hours when we were. But now, thanks to mobile, we can access the web and our apps pretty much anytime. While we have that access at all time, we still exhibit some need- and context-based patterns as we go about our days. By evaluating those patterns, marketers can generate greater insights into how to be there and be useful to consumers. 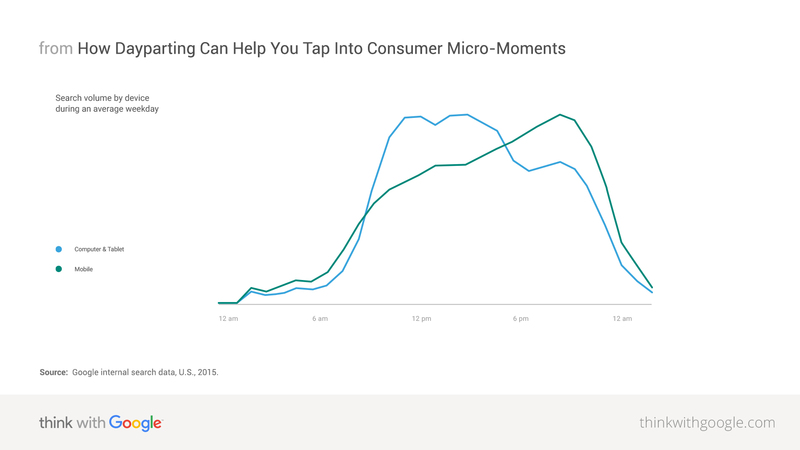 Here's some ways to tap into time-of-day insights for your own brand. Be there throughout the day, on all devices. Consumers expect your brand to be there whenever they have a need. Since search ads operate based on daily budgets, it's common for many brands to run out of budget late in the day. Be sure your budgets are set to capture all relevant demand throughout the day—especially on mobile. Be useful with a timely message. Look for search insights within your category to determine whether certain topics show unique time patterns. In some cases, it may make sense to deliver different messages or functionality to your customers depending on the time of the day they're searching. For example, a restaurant might want to promote its breakfast specials in the morning and its happy hour at workday's end. Deploying different sitelinks in a search ad is one way to offer those timely shortcuts. Similarly, an insurance company might opt to enable click-to-call functionality in its ads only when its call center is open. 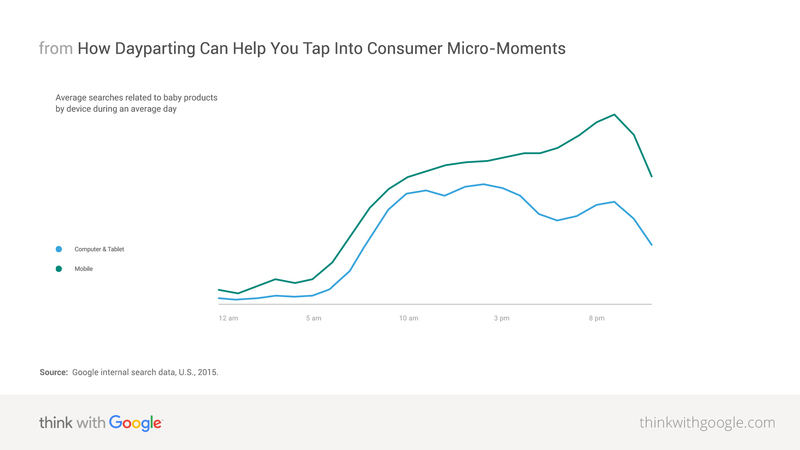 For additional best practices on how to be there and be useful in consumer micro-moments, check out "Micro-Moments: Your Guide to Winning the Shift to Mobile." 1 Google internal search data, U.S., 2015.